If you're designing a living room that needs to double up as a guest bedroom, a sofa bed should be top of your list. However if space is limited, you might be worrying that your options are limited too – this is where we come to the rescue with our selection of stylish small sofa beds. Remember, small doesn't mean your have to compromise on style or comfort. The key is to choose a sofa bed that's a two seater with a clean-lined silhouette or opt for a love seat or chair-bed. Look out for armless styles, too, as anything that makes the length and depth slimmer will help your small living room feel larger. A day bed could be the best option if you are working with a small living room as many of them are pretty narrow. This day bed from John Lewis is only 76cm deep, so can be squeezed against a wall and not be too cumbersome. It converts into a double, orrr, and get this, two single beds! Check out more nifty sofa beds from John Lewis. Some sofa beds might be compact while in sofa position, but take up lots of room when you fold them out into a bed. In the smallest of spaces, this can mean that the bed fills the room pretty much wall-to-wall, making it very hard for your guests to move around. If this is the case, look out for a sofa bed that does not need converting into a bed. They are perfect for the odd one-night stay – you simply add some bedding and it becomes a bed. We love this grey toned Yperllig Sofa Bed from Ikea, with its simple silhouette and stylish design. It's the perfect option paired with a bold paint scheme. Love seats are a great option when space is at a premium, especially more streamlined versions without sides. Larger than an armchair but smaller than a two seater, they're perfect for tight space – as long as you don't mind getting cosy. Find this Deverill Love Seat Sofa Bed in Herringbone Dew from Willow & Hall. Its removable cover is a practical addition that allows for easy washing. Make the most of a spare corner in your living room or home office with the addition of a chair bed. They sleep one so they are great for the odd overnight guest or for hosting grandkids. This Shapiro Chair Bed in Echo Aubergine is available from Sofa Workshop with a standard frequent-use sprung mattress, though this can be upgraded to a deluxe mattress. Choose from a large range of fabrics. Ensure your guests get a good night's sleep by opting for a small sofa bed with a comfortable mattress. While it may cost you a little extra, it's worth the investment if you plan on having people to stay regularly or for more than one or two nights. We love this elegant and compact Lolly Sofa Bed from Perch & Parrow. It's available in 99 different fabrics while being easy to pull out with a slatted base and luxurious 20cm deep open sprung mattress. If your living room has a maximalist or brightly coloured scheme, opt for a vibrant sofa bed that complements it. Modern sofa beds come in as many fabric and design combinations as regular sofas, so you will find yourself spoilt for choice. Style with bold or patterned cushions. We love this teal blue Aissa Sofa Bed from sofa.com. Its narrow arms give it a smaller profile, making it perfect for a small living room. Don't be afraid of fitting a squishy, tufted sofa in to your small living room. These traditional sofas have plenty of stuffing for maximum comfort, but the button-back design keeps the dimensions in check. This Truffle Sofa Bed is a guest-friendly take on Loaf's well known (and well loved) Truffle sofa and is available in 155 different fabric finishes, meaning you're guaranteed to find a style that suits your space. Check out more of our favourite traditional style sofa beds. 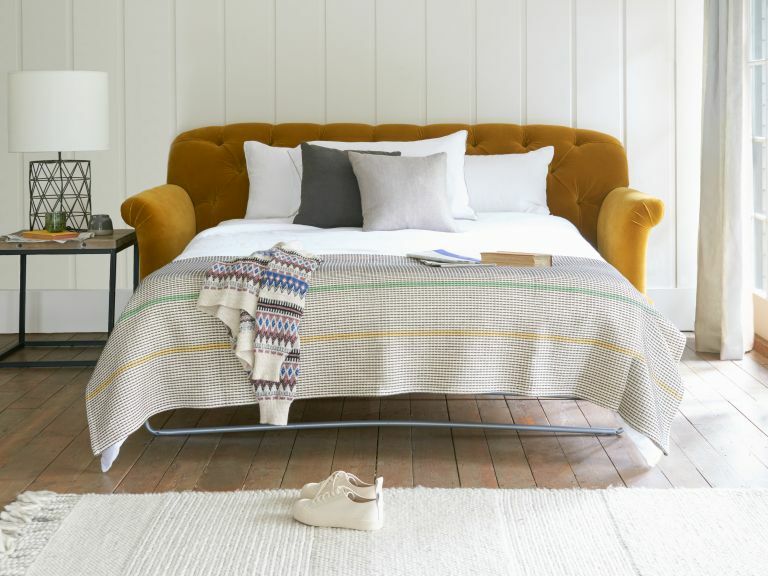 When choosing bedding for your sofa bed, opt for something that matches your living room scheme as this will help the space feel more like a guest bedroom (even if it's not). Also don't be afraid to add some blankets to make it feel cosy. Streamlined and narrow, this Harrison Compact Sofa Bed from MY Furniture is perfect for a small living space. A simple click mechanism converts the sofa to a comfortable bed in seconds, meaning it's stylish and practical. Sofa beds also come with a leather finish, if that's more your style. Just remember that leather can be quite cold to the touch, so have plenty of throws and cushions to protect your guests from a cold leather arm to the back when they roll over. This Square Arm Leather Sofa Bed from Indigo Furniture has a comfortable three fold mattress, a sprung base and comes in six different leather finishes. A bright or patterned sofa bed is a great option if you want to inject colour into a living room, especially if paired with a white or more muted scheme. The contemporary design of this Metro Small Sofa Bedfrom Furl makes it the perfect addition to a small living room. It has an angled back for extra comfort as a seat, and as a bed the thick mattress will aid sleep. If you're looking for a sofa bed that suits a modern living room, opt for something with clean lines and a simple silhouette. This Porto Sofa Bed has a 5cm deep foam mattress which is equivalent to a small double bed. Choose from a selection of five different finishes. Looking for more sofa beds or small living room ideas?